These MN12 cars haven't been built since 1997. So that means that all MN12 Thunderbird & Cougars are 20+ years old. 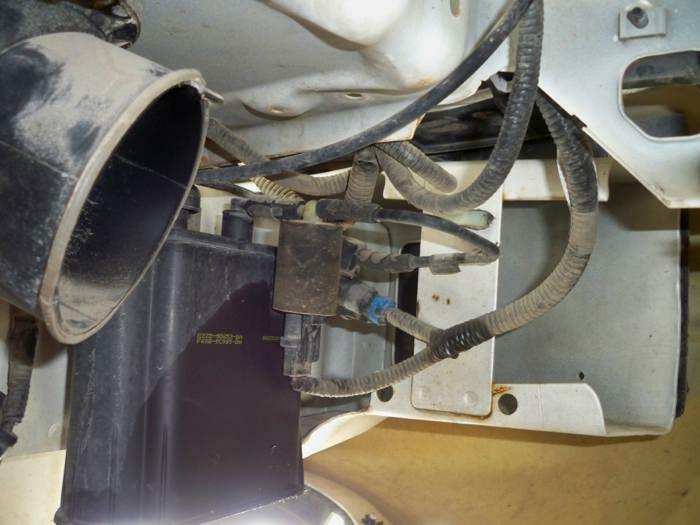 One of the things that goes bad over time, and not necessarily distance is the rubber hoses on the emissions system. 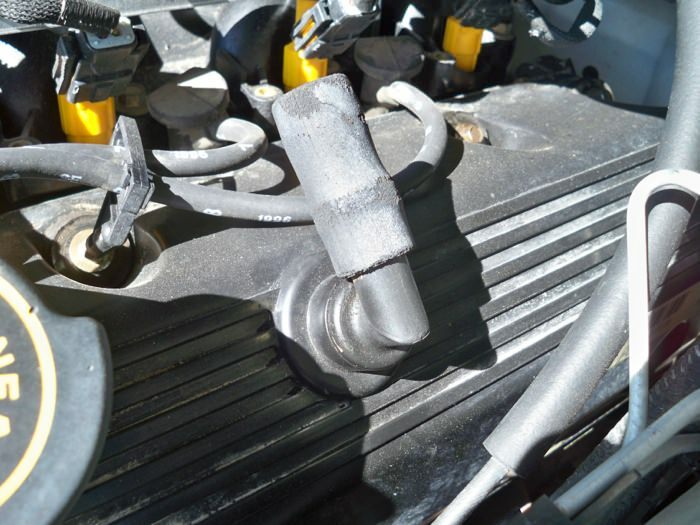 Small rubber vacuum / emission hoses can only last so long under the continual under-hood heat and road conditions. If the emission hoses under the hood of your car are original, it's time to replace them now, rather than wait. 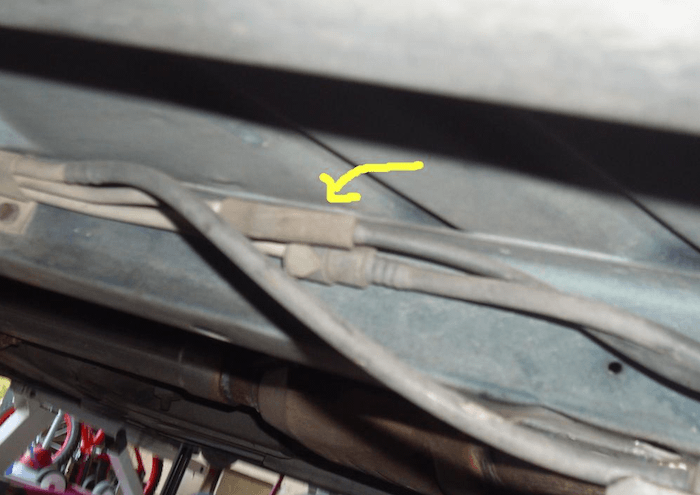 If you wait, it can lead to air leaks and cause idle or drivability problems, and most likely some diagnostic trouble codes like a P0171 or P0174. Your car may not idle right. The point is it's worth the $25 or so needed to replace the hoses to ensure reliability of your car. Now I must admit that 99% of the time I buy OEM parts. I'll go to the dealer or shop online to get the quality of a genuine Ford part. I've heard that Ford/Motorcraft parts are designed to last 160,000 miles so sometimes they cost more, OK usually. 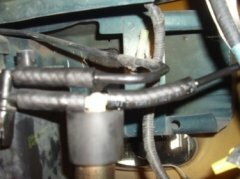 In this case where we're simply replacing small lengths of emission hose, it's likely not critical to get OEM parts. For example, I inquired at the dealer about replacing one section of hose and I would have had to buy a whole kit with two rubber end pieces and the plastic part in the middle and just that part was $30. Well the plastic part of my setup was fine, so I just went to the local auto parts store and bought emission hose. Note that these instructions apply to many more Ford 4.6L & 5.4L V8 engines besides just the T-bird. This same process applies to Mustang, F-150, Crown Vic, etc. 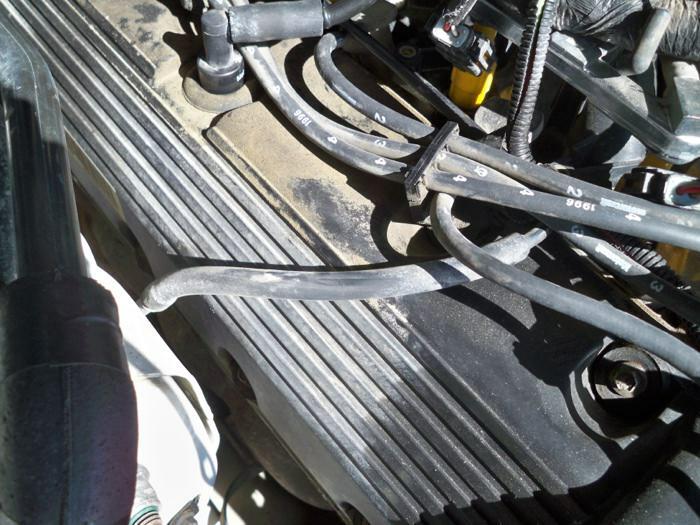 although your hoses may be routed slightly differently. 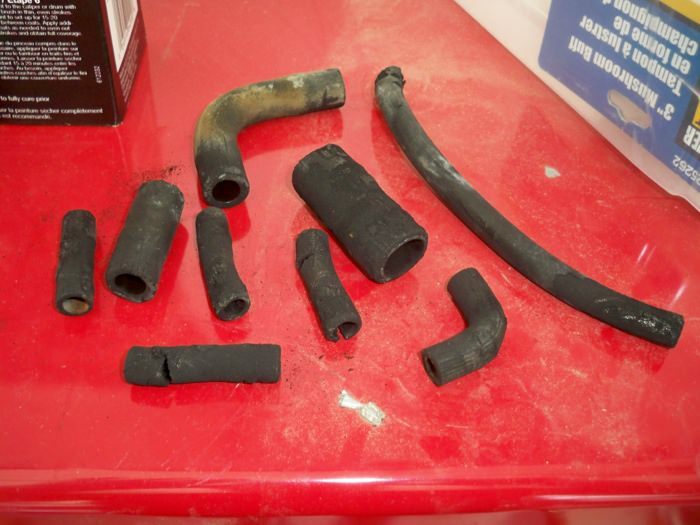 Another thing to be aware of is that you cannot use regular vacuum hose to replace emission hoses. 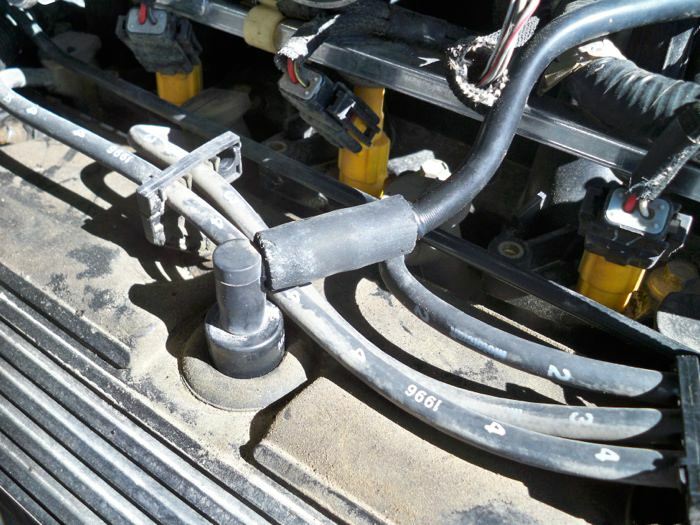 You must use emissions hose (or fuel line hose) on those hoses. Regular vacuum hoses just aren't strong enough to work. 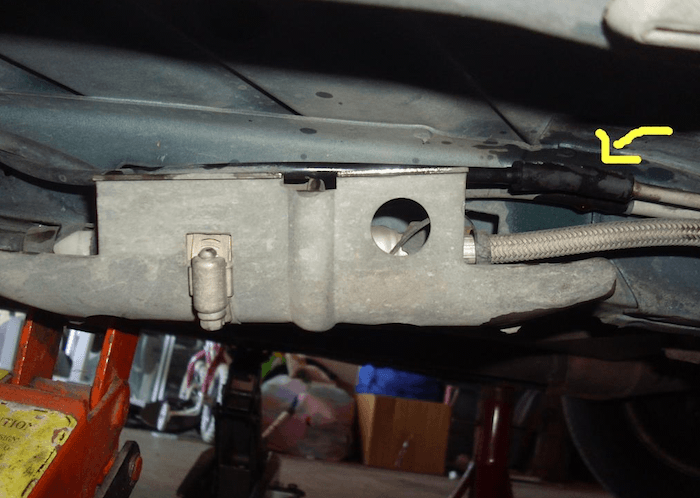 The auto parts store may try to sell you fuel injection hose, that type of hose is rated to handle a lot higher PSI (pressure) and is not necessary. As far as I know it will work, but again it's not necessary. I see there are silicone hoses on the market, I have no experience with them so I can't say if they would work. 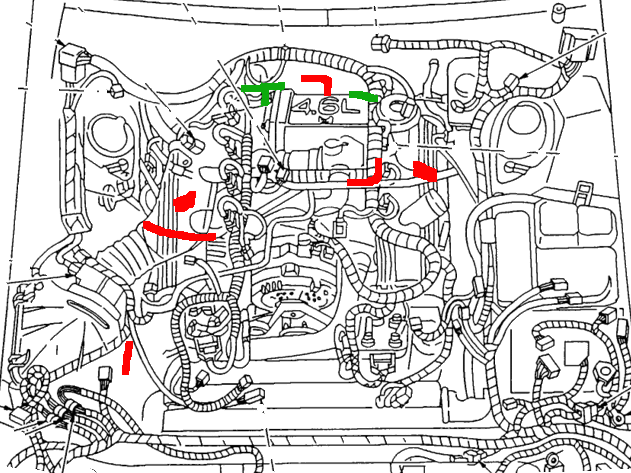 According to the factory Ford service manual, some (or all?) vacuum hoses are color coded. The manual mentions red and green striped hoses but I couldn't tell if my lines had stripes or not, they were too old. For our purposes we don't need the color stripes anyway. There should be a small sticker under the hood or on the front radiator support area labeled Vacuum Hose Routing, refer to that on your car to see where all your lines run. So I went to the local auto parts store for the stuff, but the total for those parts was a bit less (they sell hose by the foot even though you won't use it all just buy what the amounts I mentioned). Generally, this procedure should apply to all 1994, 1995, 1996, and 1997 T-Birds & Cougars with the 4.6L V8 engine. The process will be similar for 3.8L V6 and 5.0L V8 equipped cars, so refer to your underhood vacuum hose routing label for more details. There is a minor difference for the 1994/1995 4.6L cars, if your car is 94 or 95, see the note at the bottom of this article! 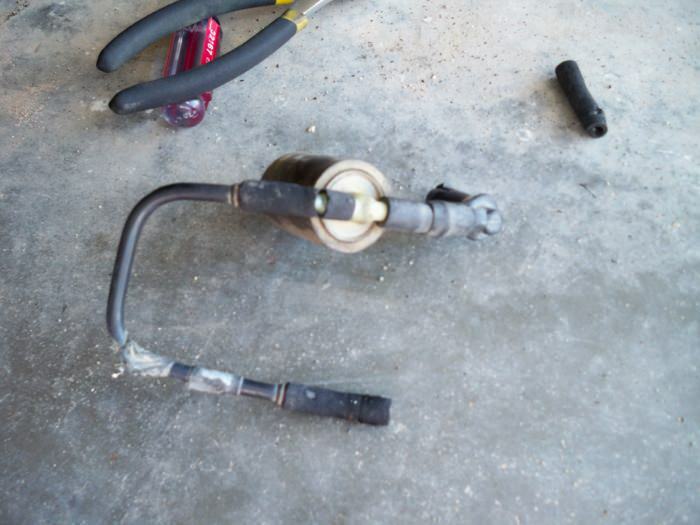 As for tools, really all you need is a sharp utility knife or maybe scissors to cut the hoses. You want nice clean cuts, preferably. What I'm not including below is how I determined what hose sizes I needed. I used a digital micrometer and measured the internal diameter of the existing hoses and the outside diameter of the things they attach to. I figured out what is the closest size and that's how I arrived at the three sizes: 1/4", 3/8", and 5/8". Technically the hoses could be a very slightly different size but all of the hoses fit OK. If you get a hose diameter that is too large you risk having a vacuum leak. First off, to put this in perspective, this is all my old hoses laid out after I replaced them with new pieces. As you can see, they are crumbly and no doubt had a few minor leaks in them. When you touch the hoses, they leave black on your hands which means something is not normal. Vacuum leaks are not good, so let's get started on replacing them. 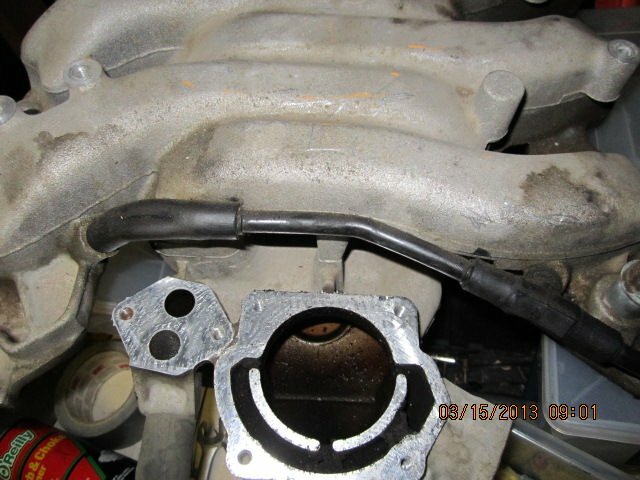 To make things easier, I removed the air duct going from the MAF (mass airflow) sensor to the throttle body, which also has a smaller duct running back to the front of the throttle body where the IAC (idle air controller) is. 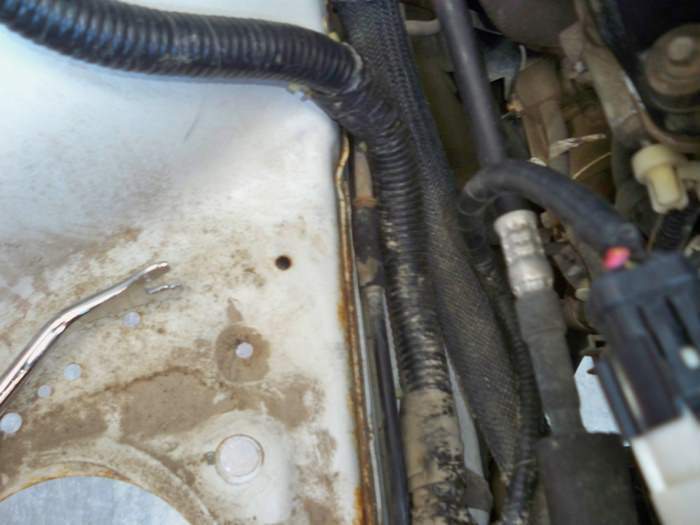 Next, I used a small section of the 3/8" fuel hose to replace the crumbling hose connecting from the passenger side PCV (positive crankcase ventilation) valve to the plastic tube that runs up to the intake. While I'm at it, shake the PCV valve when you have it out, see if it rattles. Generally if it rattles, it's still good, if it doesn't, it's time to replace it. That's an easy DIY maintenance task to do. Next up I replaced a length of hose that runs across the passenger side valve cover. This uses the 1/4" fuel line hose, approximately 5 inches long. Again, take the old hose off, hold it up to the new hose and cut off approximately the same length of hose. Next up I replaced the L shaped hose that comes directly out the back of the throttle body and goes off toward the passenger side of the car. The original hose may have been molded with the bend, however I used a straight piece of 1/4" fuel line hose and it conformed well enough for my purposes. This hose was really rotten and cracked on my car. 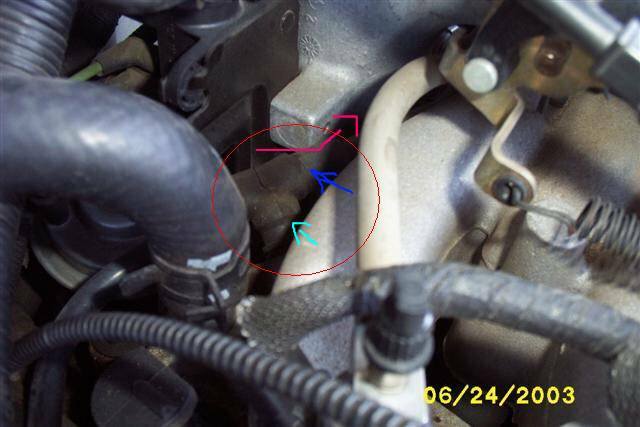 There is a similar hose, same size L-shaped coming off the front of the throttle body, replace that one too. I don't have a picture handy but it has the same bend off toward the passenger side of the engine. So, what you'll see down there is the charcoal canister which is part of the EVAP (evaporative) emissions system. It has some rigid plastic lines, wiring, connectors, etc. There is a U-shaped piece of tubing/hose and that has a few small rubber pieces that need replacement too. Here is a photo of the area with the charcoal canister in place before I did anything. The other photo shows the U shaped piece that I removed as a unit (you need to disconnect one wiring connector, you'll see which one), and that allowed me to easily replace the small pieces and put it all back together. Well that covers the hoses that I replaced. 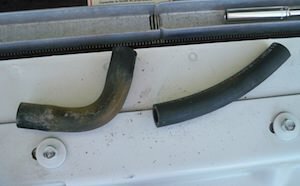 I got all the rotted rubber hoses replaced that I could see, let me know in the forum if I have missed anything, or if you have any feedback or comments on this article. 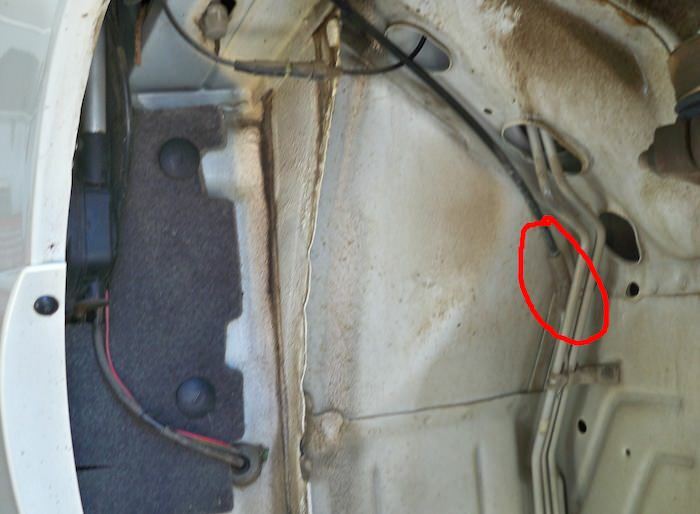 UPDATE: Another hidden EVAP hose found! 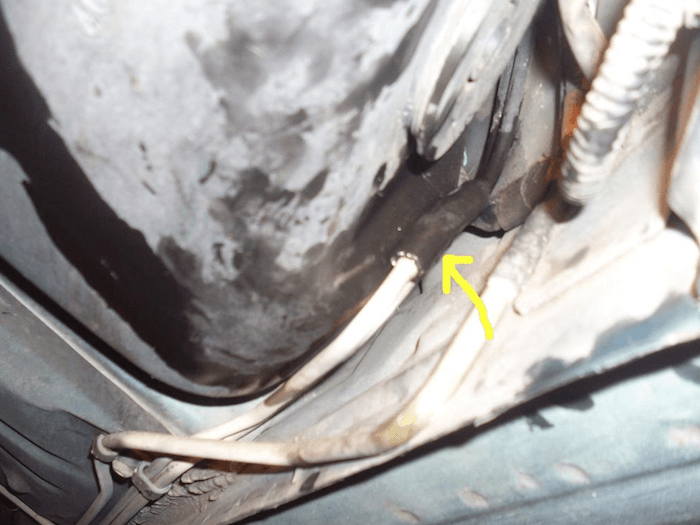 NOTE: If you have a 1994 or 1995 4.6L car, there are two additional 3/8" hoses to be aware of. Secondly, the tube that goes off from the Tee toward the drivers side then goes into a plastic tube, and at the other end of the plastic tube is another short rubber piece. This is awkward to get to, that line runs under the plenum / throttle body along the fuel line into the intake manifold. I disconnected the other rubber piece (other side) off of the intake maniold, by squeezing some needle nose pliers and working it off. It's a very tight squeeze, have to be careful not to pinch or break fuel line. Then I pulled towards me by grabbing the rubber hose I just pulled off. Which came out with the plastic tube that goes across and connects to the T.
Thats pretty much it. Easy but a process LOL, After replacing that and the one that runs by the airbox. It fixed this bad vibration I was getting everytime i turned the wheel when idling. Which some people suggested to change power steering pump. But yea its gone now, Next when I find time i need to fix the ones in the fender. From what I can see from up top and underneath they're all cracked. I suspect this also applies to other Ford models of the same vintage, probably the Mustang and Crown Vic are the same or similar. I also suspect that the 1992, 1993, 1994, and 1995 T-Birds/Cougars are similar. I can't say with 100% certainty that this is exactly the same for all the other years and engines including the 3.8L V6, but this should give you an idea of the work involved. 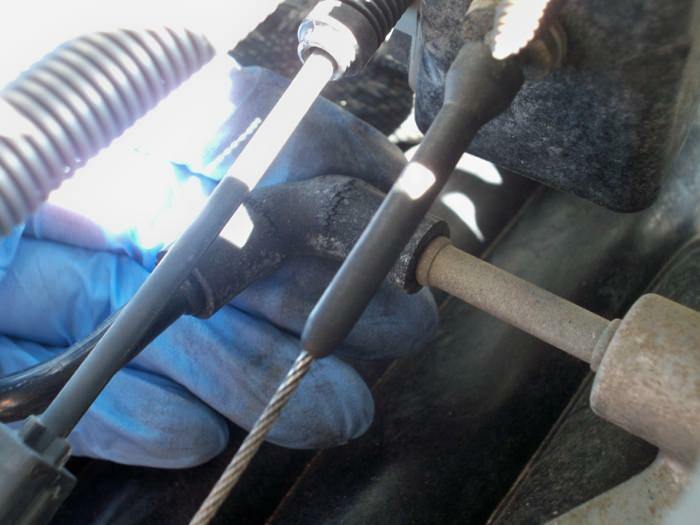 I hope this article has helped you keep your car on the road longer.